Boxeo TELEMUNDO Ford makes its 2017 debut this Friday. It will be another edition of the classic boxing rivalry of Mexico Vs. Puerto Rico in the main event. Carlos “The Kid” Narvaez 15-0-6 KO’s of Manati, Puerto Rico will take on Ricardo “Meserito” Rodriguez 15-3-4 KO’s of Mexico City, Mexico. The bout is scheduled for 10 rounds with Rodriguez defending his WBO Latin Jr. Bantamweight title. The site of the event will be the Tony Rosa Community Center in Palm Bay, Florida. 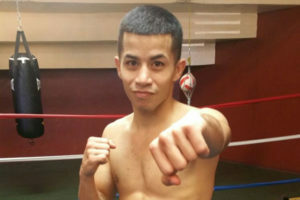 Narvaez will be making his Telemundo debut and risking his unbeaten record. It will be a big step up in class for him but one that he feels he is ready for. How has your training camp preparation been for this fight? This was my best training camp to date. It had it to be has this is my most important fight of my career. How do you feel about fighting on Telemundo for the first time? I am very greatful for the opportunity as many people will get to see me for the first time. What can you tell us about your style for those who have not seen you fight before? I am the kind of fighter who adapts during the fight. If I need to bang I will bang. If I need to box then I will box. Whichever of the two that will lead me to victory I will do. Palmdale has large Puerto Rico population. Do you expect alot of local support? This is very true. Many of my fellow Puerto Ricans reside in this area. I expect alot of support locally and from those watching on television. I have seen Rodriguez fight many times on Telemundo. I really respect his skills. He is a very good fighter. The Mexico vs Puerto boxing rivarly has delivered some very exciting fights over the years. You are now set to be involved in one of your own. What are your thoughts on the rivarly? I believe this fight will be another all out war contuing the tradition. I am coming to do my part to get another victory for Puerto Rico. I want all those who can watch this fight to please do so. You will not regret it. I have trained so hard for this fight. I am coming to bring that title back to Puerto Rico with me. This will be the first step in me achieving my ultimate goal of having my name amongst the best Puerto Rico has had in this weight division. The show is being presented by Tuto Zabala’s Jr., All Star Boxing, Inc in association with Telemundo Deportes, Florida’s Space Coast and The City of Palm Bay. The main event will be televised live at 11:35 PM on Telemundo. The Tony Rosa Community Center is located at 1502 Port Malabar Blvd, Palm Bay, FL. 6 Bouts total, doors open at 7:30 PM, first bout at 8:00 PM. Tickets are already on sale by calling (321) 952-3443 or at the door the night of event.